Orda Ellen Burge, daughter of James Henry Burge and Mary Jane McCullough, was born April 3, 1891 near Gravity, Taylor Co., Iowa and died July 17, 1970 in Lenox, Taylor Co., Iowa. 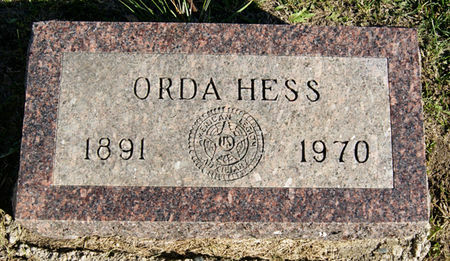 She married Otto Hess June 8, 1927 at Bedford, Taylor Co., Iowa . Searching for ORDA ELLEN HESS in Taylor County Iowa?